Rihannas:WE FOUND LOVE VIDEO"Banned in France for being Sexually Provocative!! Rihanna’s new video We Found Love has already drawn controversy by appearing to allude to her abusive relationship with ex-boyfriend Chris Brown. But now it appears French authorities believe the video could inspire ‘self-destructive behaviour’ after banning it from being shown before 10pm. 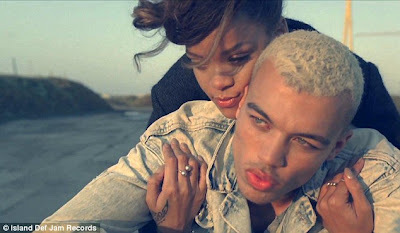 The promo details a destructive relationship between a couple – played by Rihanna and model Dudley O’Shaughnessy – and features shoplifting, smoking and the singer being slapped on the bottom. They also thought more romantic scenes between Rihanna and O’Shaughnessy were ‘pronounced suggestive’. Next article Beyonce Again???? Media TakeOut SCREAMS Beyonce is not Pregnant Again!!! !